Sunny. High 82F. Winds SW at 5 to 10 mph..
Carlos Clemente says he is often told he appears younger than his 52 years of age. The Mexico City native credits the job he has had since the age of 15 for keeping him physically and mentally youthful. Clemente is a professional Latino clown or payaso. 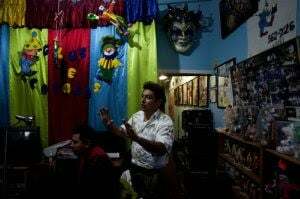 Something else that keeps him active and young at heart is the Club de Payasos, a Boyle Heights-based association he founded in 1985 for Latino clowns who perform primarily in Spanish. Clemente, who immigrated to California from Mexico in 1982, said he started the club out of a need to meet other Latino clowns. The club was first started in Monterey Park, but in 1994 Clemente found the club’s permanent location on Lorena Street in Boyle Heights. The club is housed in an inconspicuous apricot stucco storefront north of the I-60 freeway on Lorena Street. Inside the club’s front room, dozens of clown dolls, figurines and paintings decorate the walls and shelves. Many of the items on display are gifts. Among those gifts include a toy ring a boy gave Clemente at a party to thank him for making his paraplegic sister smile. In the back of the club, there are dressing rooms that house a wardrobe of bright colored clown costumes and shoes. On the hallway walls, many photos of Clemente and other clowns at public appearances are posted including one with Los Angeles Mayor Antonio Villaraigosa. 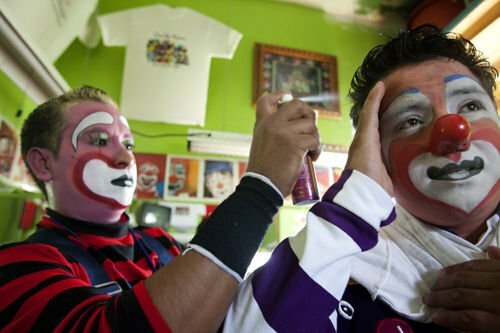 The club currently has 15 clowns – five of them women – who mostly work on the weekends at parties, baptisms, and other family oriented events.“All the clowns have other jobs because working as a clown is not going to make you rich,” said Clemente whose other job is running a party supply store with his wife. Clemente began training as a clown at the age of 15 in Mexico City. As a teen, he was looking for a job as a songwriter but came upon an advertisement to audition for a job as a clown. He discovered he was a natural at entertaining children and decided to pursue it as a part time profession. For now, he plans to keep working as long as he has good health. A: We get paid to have fun. We go to parties, entertain, and get paid at the end of the job. Q: Why did you start the club back in 1985? A: I wanted to meet other Latino clowns. At that time, there were no clubs for Latino clowns that I remember. When I started working as a clown here, there was a time when I didn’t charge charities. I worked for free. But since I came here for the American Dream, I had to start charging. I needed to pay the rent. To support myself, I’ve always had to work other jobs, sometimes two jobs. When I came here, I worked as a dishwasher and a janitor, and I would work as a clown on the weekends. Q: What is one misconception about clowns that you want to correct? Is there something that you want the general public to know about clowns? A: It’s an art form. Being a clown is an art form. It’s not just painting your face. I want people to know that clowns have an education and a culture. Clowns have a history from the time when they entertained kings. One thing our club does every year on the first Sunday of December is the Day of the Clown. It’s free for the public and we have it for two reasons; to promote clown culture and to bring the traditions from the Latino countries we come from while respecting American culture. Q: What are the difference between Spanish speaking clowns and other clowns? A: There are a lot of differences. The humor is different. That is our success with our clients who hire us to perform in Spanish. But with children, even if they don’t understand Spanish, they understand laughter. Q: How has the economic downturn affected the club and your job as a clown? A: This business has its ups and downs. That’s why most clowns don’t stay in it permanently. December and January are bad for business because many people leave the country to visit family in Mexico for the holidays. The summer is a good time for us. The economy started affecting us seven years ago. But we got together as a club and said ‘how can we survive?’ The first thing we did was to hold workshops to improve our skits and update our costumes. Something else we do is not raise the prices because for some hiring a clown is a luxury. Q: What does your family think about your job as a clown? A: My wife and I don’t have children. We consider the clowns our children. Sometimes we feel sad when they leave, but you must let your children fly and become independent. Q: What are the requirements to be accepted to the club? A: You must be 21 years of age, have a valid ID, and you must have experience working as a clown. You can have a little experience and what you don’t know we’ll teach you. Also, you must be employed, part time or full time. Like I said before, you cannot support yourself on what you make as a clown. You need other jobs to survive.